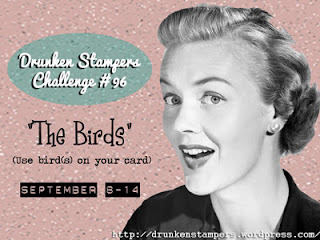 This week's Drunken Stampers challenge is to feature a bird...I love the SU bird and owl punches, I use them a lot. For this challenge I wanted to use a punch to make something other than what it was intended for...so I used the owl punch to make a penguin!! Check out the Drunken Stampers blog for all the details on this challenge and be sure to visit the Design Team members blogs to see all the cards for this challenge. We encourage you to play along with us!! Don't forget to add your card at the Drunken Stampers blog using the Linky tool to be entered for your chance to win our weekly "Life of the Party" award. I love the penguin!! Love that you made him, great job!! so cute fabulous job, love the look of your blog too. SUPER Cute! Creative punchers always amaze me!!!! LOVE the balloon tip too!